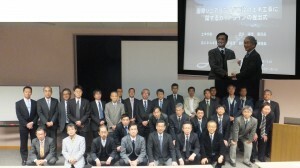 On 13 March 2014, a colloquium to mark the completion of the guideline for the civil engineering of the International Linear Collider was held at KEK laboratory, Tsukuba, Japan. A total of 47 scientists and engineers cerebrated the accomplishment. The guideline was handed over to Atsuto Suzuki, KEK’s Director General, by Hiroshi Chikahisa, chair of the subcommittee that produced this guideline. This guideline was published by a special subcommittee under the Japan Society of Civil Engineers (JSCE), formed back in 2009. The “subcommittee on ILC civil engineering” which was formed under the Committee on Rock Mechanics. It took five years for them to clarify and sort out the challenges and agendas regarding the ILC civil engineering works, and the proposed solutions with regards to the current capability. The subcommittee members visited and conducted surveys on the ILC candidate sites, and interviewed personnel involved in the project. They also gathered and analysed a huge amount of information on large-scale constructions, such as case examples of use of underground space, and their guidelines and standard specifications. Based on those works, this guideline was put together to enable the best and most cost-effective construction of the ILC, avoiding any possible backsets or duplications in the process. This guideline was adapted to the Japanese environment to realise the best practice on the ILC construction in Japan, but the committee believes it will be effective for the construction at any overseas sites, and also useful to other large-scale underground constructions. Prior to this guideline, a special team of the subcommittee on the civil engineering for the ILC under the JSCE’s Committee on Rock Mechanics produced two reports on the ILC site study in 2009 in cooperation with KEK, in response to a request made by KEK’s then Director General, the late Yoji Totsuka, in 2005. Then, timed to coincide with the release of the ILC’s Technical Design Report (TDR), they completed this guideline. 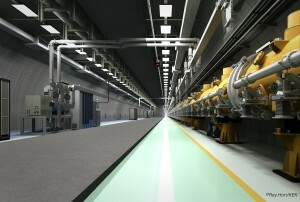 “Japan has developed world-class technologies for underground constructions for various purposes. We aimed to draw up this guideline to put together those technologies, coordinate them optimally, and utilise them as adequate technology for the ILC construction. This process was an example of the ‘spirit of harmony’, a particularly Japanese manner, in the field of technology, and I believe that this spirit will be one of the advantages of building the ILC in Japan,” said Chikahisa. The last half of the colloquium was a debriefing session, which was followed by lively discussion on the technical issues from a mostly practical viewpoint. This guideline will be publicised on KEK and ILC website soon. The English version will be available by summer.